I have a basic question. I want to see the complete implementation of MPS default plugins such as Java Integrations,MPS Build Language etc. I found the MPS plugins on github and cloned to my computer.How do I Import them to MPS as MPS project so that I can see all Actions,Groups Nodes etc? Any suggestion. do you mean you cloned the MPS project from https://github.com/JetBrains/MPS ? Here i am attaching the screen shot for reference. Unfortunately, I do not see the screen-shot. I guess you need to insert a link to the attachment using the wiki syntax. I have attached the screen shot. please let me know the issues. It is hard to guess from the image. Could I ask you for a full stack trace? 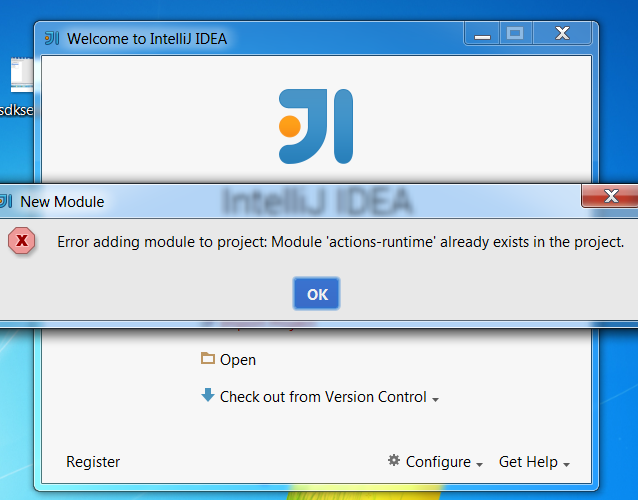 Also, which version of IntelliJ IDEA are you using? I am using Intellij 14.0.2 version. please find the stack trace here. I suspect your IDEA has a different (older?) 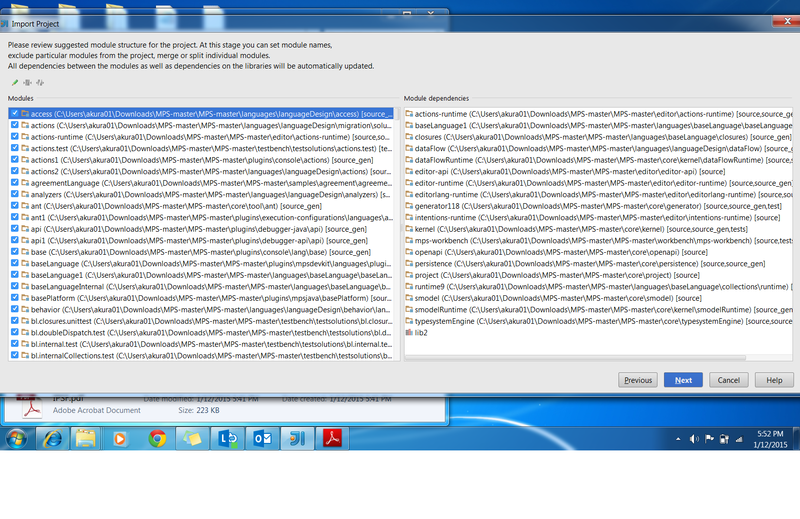 version of Ant jar files configured as a global library. Could this be the case? To me it seems all the errors indicate differences between expected and existing API of the Ant classes. I have checked the global libraries in the project structure menu, It shows me (Nothing is here), do we need to configure any other things. i am still facing problems while setting up the MPS in intellij idea, Are there any pre requisites for setting the project. 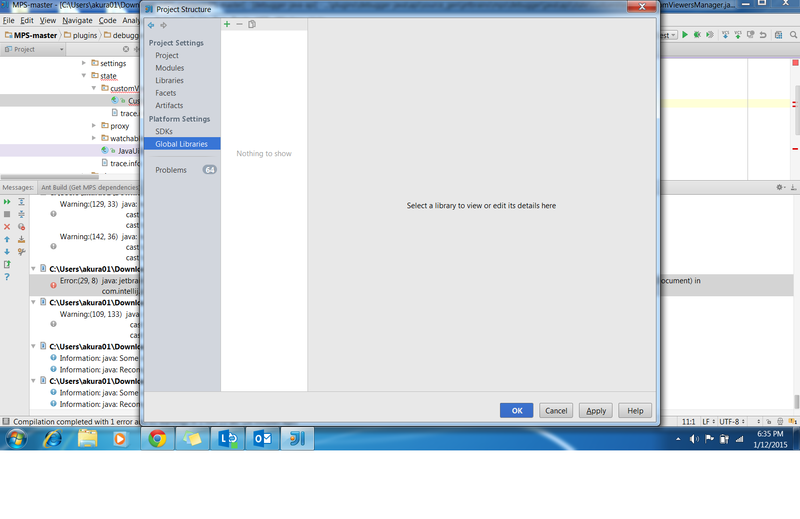 3)Next step: SDK selection I have choosen(Intellij platform SDK). 4)Next step: Selection of module project structure, It pops up with the dialog saying File already Exist( overwrite or Reuse) I selected Reuse. After Finishing I was facing the issues that i mentioned in the above thread,please let me know do i need to do any setup for importing the mps project. You should not need to import the project into IDEA. The cloned repository is already an IntelliJ IDEA project, you only need to open it in IDEA - File -> Open (point to the directory of the mps project). No further steps should be necessary. Any clue how this would be fixed? prettyPrint(); in project dir and then re-build the project. I cleaned and Re-Built the Project and still same error comes while Running. 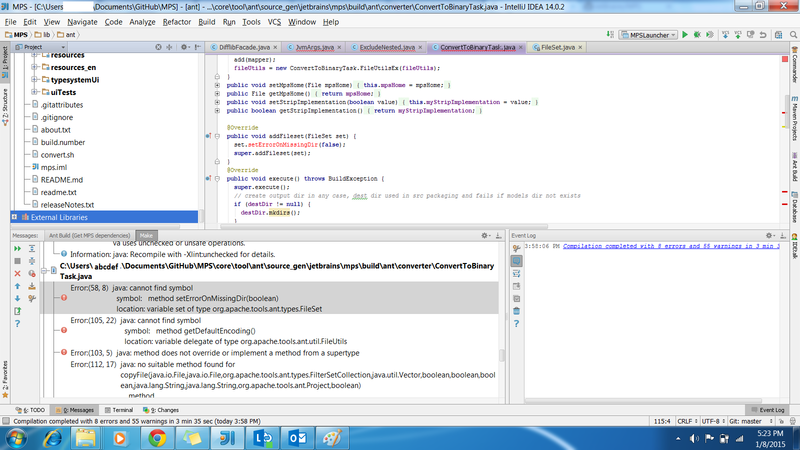 I can see the MPSMainImpl.class file in mps-workbench/jetbrains.mps.ide/classes/jetbrains.classes. Any Idea, what may be causing this? I got some clue , I am giving 1024m as heap memory, do I need to give more space for IntelliJ to search the MPSMainImpl.class. Is there anything related to this.? Hi, We tried with JDK 1.7.60 with 64 bit and 32 bit on 4 Machines, Out of which on only system MPSLauncher worked and rest all while running give same Exception. Does anyone have any clue for this? The project GitHub page https://github.com/JetBrains/MPS mentions that only JDK 5 and 6 are supported at the moment. I'm guessing that on JDK 7 things may go wrong sometimes. Could you please test on JDK 6?